18 Brook Street #208, Asheville, NC 28803 (#3458008) :: Robert Greene Real Estate, Inc.
Stop scrolling, you just found it. Welcome home to your private retreat at Biltmore Courtyard. This condo has a private access stairway and elevator access in addition to an assigned parking space just outside the entrance! 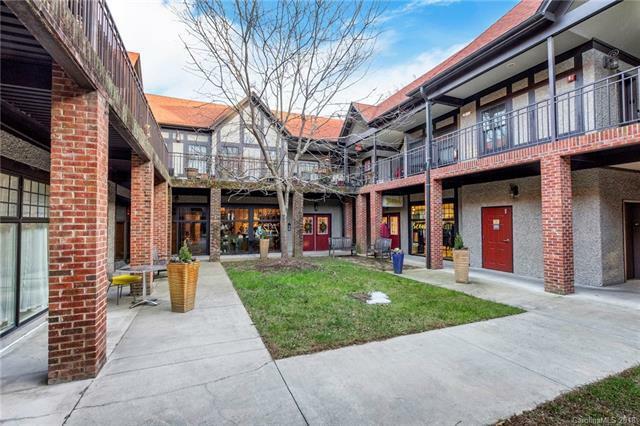 Hangout in the atrium or downstairs at Fig or enjoy a night out on the town as restaurants and shops are just outside your doorstep in Biltmore Village. Less than 1700 feet to the entrance of Biltmore Estate entrance and less than 2.5 miles to Pritchard or Pack Square Park in the heart of all downtown Asheville has to offer. Schedule your private tour today to see this one bedroom light and bright condo featuring granite countertops in the kitchen and bathroom, hardwood floors, vaulted ceilings with skylights bringing in extra light into kitchen and family room. Relax next to your gas fireplace in the family room with a good book or a flick on the TV or escape to adventure just outside your doorstep at your future getaway at 18 Brook Street, Asheville NC.